Erosion is a widespread problem throughout Alaska, with at least 31 villages and towns facing imminent threats. 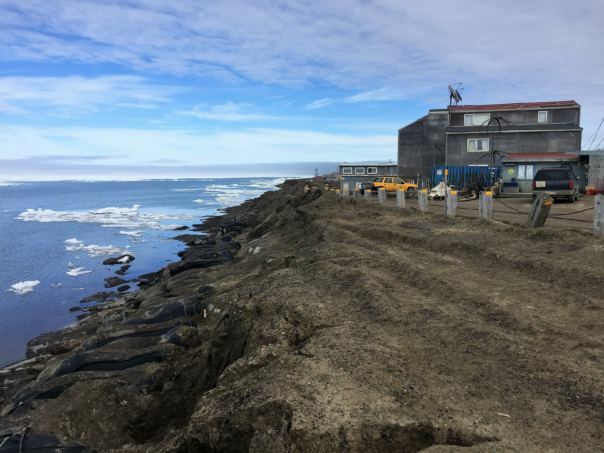 In Utqiaġvik, a lot of that erosion is connected with storm damage. As sea ice continues to trend toward coming in later and leaving earlier, it makes the coastline vulnerable to storms for more of the year. And as the erosion problem continues to get worse, the municipal government is facing tough questions about how to combat the issue going into the future. A big North Slope Borough truck rumbles down the road that divides downtown Utqiaġvik from the Chukchi Sea. Scott Evans is behind the wheel; he works for the department that’s responsible for emergency management and disaster coordination within the North Slope Borough. To our right is a sandy playground, and to our left the small sprawl of downtown: the Arctic Slope Regional Corporation headquarters, the courthouse, Wells Fargo bank and a few houses with sandbags stacked outside. Evans points to the houses closest to us, and says that during a storm that hit Utqiaġvik last September, this area at the base of downtown was flooded. “These lower houses right here, the lower-lying houses… the water certainly reached them,” Evans said. The cost of the damage from that storm to the North Slope Borough is still being figured out, but the rough estimate is $8 million. That reflects damage to roads and the structures that were supposed to protect the town from storm surge: a 600-foot seawall, sandbags and a five-mile gravel berm that spans much of the coastline. The borough is also worried about what might happen in the future to things like a critical water and sewer pump station, the drinking water lagoons and a decommissioned military landfill site located right by the beach. Utqiaġvik is losing ground, and part of that has to do with these storms. “If you’re here, and you watch a storm, and you watch the way we have to just continue to try to throw gravel at it and watch what it does to it, you realize that it’s a losing battle,” Evans said. Right now, the borough’s main tool for combating the problem involves exactly that: throwing gravel at it. They’ve got a seawall made of wire mesh filled with gravel bags, huge “supersacks” full of gravel and a gravel berm they have to keep building up. The height varies, but even at 20 feet, it can be wiped out in a matter of hours if the right storm comes along. 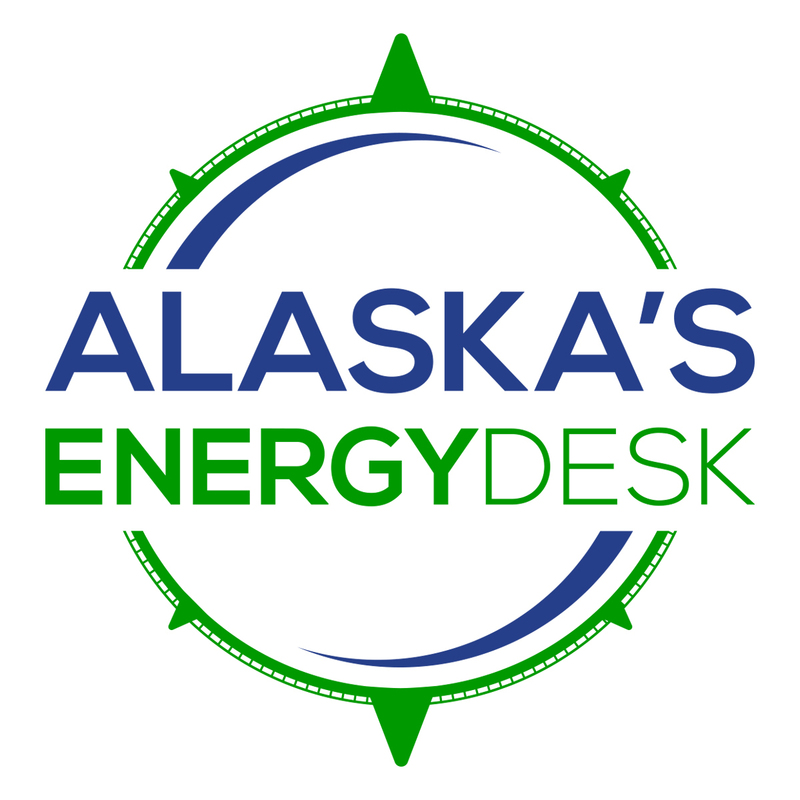 When the damage from a single storm event goes beyond what the North Slope Borough can pay for on its own, it can seek help from the state and federal governments. That happened in 2015, and again with the storm last September. But there’s a lot of damage from smaller events that the borough is on the hook for. On top of that, they’re running out of material to hold back the ocean. Bob Shears works for the North Slope Borough’s capital improvement department and is one of the people on the North Slope who’s thinking about how they’re going to address this problem in the longer term. “Gravel here is almost akin to gold or silver: it’s that hard to find anymore,” Shears said. Shears says that the U.S. Army Corps of Engineers will be releasing a study for public comment later this month, looking at engineering options that could protect the town for years into the future. The corps is still deciding exactly what that would look like, but essentially the idea is to armor the coastline in front of Utqiaġvik with big 2.7-ton rocks, so that from the ocean it would look like a continuous rock wall. A preliminary estimate for all that is $120 million. About one-third of that would be paid for by the North Slope Borough. The rest would have to come from Congress. Shears says that’s nowhere close to a done deal. And even if they do get the money, Shears thinks it could be awhile. Which means they have to figure out something else in the meantime. Back at the Utqiaġvik coastline, I ask Scott Evans if the borough is ready for the storm season that’s just around the corner. Evans says that they’re getting federal and state assistance to build things back to where they were before last year’s storm and make things a little stronger for the future. In addition to federal and state money, the North Slope Borough will also use its own funds to make improvements. The rest, they’ll have to cross their fingers for and hope that the coming storms don’t outpace their ability to fend them off.